I was 37, maybe 36, not sure, and I sat down to watch a movie on Netflix. The movie seemed like it was telling my life story at the time. I was the host of an online radio show, so I looked into the star of the movie, mentioned it to the followers on my Facebook page and I was just coming down from the high of a very successful interview with another actress and my followers told me to get this lady for my next interview. I researched this actress, got in touch with her and I finally talked her into coming on my show, but she convinced me to save my life. You’re probably thinking, what? Well, let me explain. She and a few others convinced me to take on the challenge of riding my bike from San Francisco to Los Angeles with a bunch of other crazy, beautiful, awesome people and if you know the state, you know that is a very long ride, almost the length of the state (545 miles). So, I began training, which was excruciating. I saw this woman on training rides, she would even help me out on a ride or two. She inspired me in spin classes and not by doing much, just simply leading by example. I would eventually remember things like the way she said she ate, and more so, what she didn’t eat, when I realized I couldn’t keep up on training rides. I would hold on to something she said once about yoga when I needed to stretch more and like I said, she never barked at you or told you what to do, not even a suggestion, I just watched the woman who would become our AIDS/LifeCycle Team Goodisness captain, actress, badass and philanthropist Traci Dinwiddie and grabbed whatever I thought I needed to survive. What I ended up grabbing was the deletion of meat from my diet, as it was weighing me down, mostly getting rid of sweets, bread and French fries, which I love. All of these things were gone, even before our departure to the Bay. Once in the Bay, I slowly realized what I had gotten myself into. All of a sudden I knew that I would not return to Los Angeles the same person I was when I left a few days before. During training I had been the slowest person on every ride and people said the momentum will carry you your first day and you’ll be fine and so on and so on and of course, I did not believe them. We rode 83 miles the first day of the ride, which I finished every mile. I didn’t get off my bike to walk any of the mileage that day and that surprised me because there were some awful hills, even on the first day, but I peddled and peddled to the end and I swear if I could I would give you blow by blow, every day and every step of the journey, I would, but in the interest of time, let’s cut to the chase. I have never felt so loved by so many people. I have never felt so in unison with so many beautiful people in my life. I was raised in the church and I have never seen so much love and genuine concern for one another. 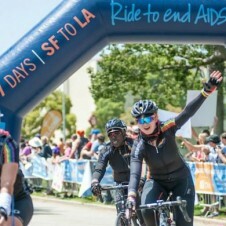 I rode every day, I didn’t finish each day, however I completed more days than not, but what’s important is that I not only learned about HIV/AIDS, but because of all of those wonderful people and all of my Team Goodisness sisters, I learned about me, my strength, myself and my life has changed because of this ride. What I picked up didn’t wear off when I returned. I have made a radical change since returning to my hometown. I took a look at myself and realized I had been on autopilot my whole adult life and decided I didn’t want to live like that anymore. I have since gotten on the path to make a career change, my diet and exercise have remained the same and I stopped consuming alcohol as well and the only thing I can credit is God, for weaving everything that led up to AIDS/LifeCycle 2014. This ride was what I needed to do, this was ride was my destiny and it smacked me in the face with love for others and myself. There was no way this train was leaving without me and I am poised to do it all over again next year. I have 78 new sisters and one brother and they span over 14 countries and God knows how many states and I believe the bulk of us will remain friends for the rest of our lives. Join us: A group of sisters, with the exception of our one brother, from all over the globe and it is truly a family affair. When they tell you that you will never be the same, they are right. This experience will definitely change your life if you allow it. See you on the road. Learn more about Team Goodiness or contribute to Dana’s ride. Posted July 16th, 2014 & filed under Blogs.